Palawan offers great holiday activities and opportunities, with its stunning wildlife and vistas. During my trip to Puerto Princesa, I was able to experience various tours that, I think, would suit people of all ages. With guides and travel operators who really care about their place, you can take the following tours to explore the beautiful city. The city of Puerto Princesa is a tropical paradise with a bustling urban center that is perfect for business with leisure trips. Its white-sand beaches and lush rainforests are simply hours away from the city proper, and by checking them out, you will be able to see for yourself how rich the city is with natural wonders. You will be able to visit the Baywalk, Plaza Cuartel, Immaculate Conception Cathedral Church, with a quick stop off at the “tiange-tiange” souvenir shopping center. Also, you can visit the city’s Palawan Rescue and Wildlife Centre—formerly known as the Crocodile Farm—which is part of a re-population program. With the guides, you can take a look around the public areas of the research center, which will give you the opportunity to see crocodiles of various sizes and ages. The Crocodile Farm also has a mini-zoo that features other endemic Philippine species, as well as the Research Institute that is dedicated to all things crocodile. I would recommend you to follow the guidance given by your guides with regards to not throwing items into the pens. 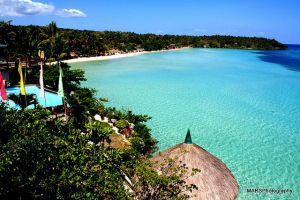 The Dos Palmas Island Resort & Spa is a 20-hectare private island that is nestled in the tropical waters of the Honda Bay. The area is known for having a rich marine ecosystem, with wide areas of mangroves and forests to the south and kilometers of beautiful coral reef all around it. The resort can offer all you need for a luxurious island getaway, whether you are visiting it with your family, friends or with your partner. The day tour package includes a buffet lunch with great food that Dos Palmas is known for. You can enjoy a variety of grilled food, including pork, chicken, fish and other seafood, which really makes the price of a day ticket worthwhile. Aside from the food, you can also enjoy a wide range of water activities, from kayaking to scuba diving, as well as non-water activities, such as tennis, billiards and even the simple board games. If you are not into these, you can just sit back and relax with the soothing island atmosphere. Located south of Puerto Princesa, the Irawan Eco Park (which is a 3,000-hectare flora and fauna protected area that forms part of the Irawan Watershed) can be accessed even if you are a non-hiker. No matter how adventurous you are, the activities here can make your trip enjoyable. You can take the forest canopy zip line or the eco and river tour, which is enough to explore and commune with nature. The Irawan Arts Café and Gallery showcases artwork of the resident artist Jerome Ray Miano and other local artists with the Aborlan Arts Program. 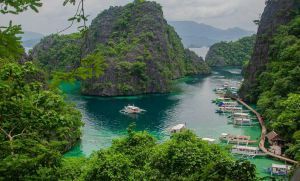 Aside from these tours and activities, there are more things to do when you go on a trip to Puerto Princesa, such as going to the Underground River, firefly watching and touring the Honda Bay. Unfortunately, I did not have enough time to do all of them. Well, I hope you do for your trip to this place!